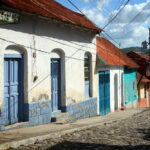 Belize and Guatemala, two absolute gems in Central America. I’ll admit I had never given much thought to them before planning my Latin America itinerary this year. 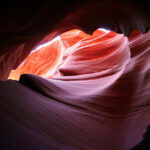 However, two weeks of traveling the region made one thing very clear: this is a part of the world you have to see! Planning a trip to Belize and Guatemala? 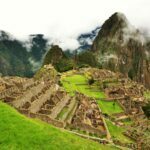 Whether you’re dedicating a trip solely to these neighboring countries or as part of a larger Central America, Latin America, or global trip, these countries are truly un-Belize-able. (Sorry, couldn’t help myself). Here are my tried and true suggestions for how to spend two weeks in Belize and Guatemala. Begin your Central American adventure by flying into Belize City, Belize. You’ll need to take a taxi to the city center at a fixed price of $25 U.S. or $50 Belize ($1 U.S. = $2 Belize — easy enough to remember). There aren’t a ton of budget accommodations in Belize City, so I’d recommend either finding a place through Airbnb (follow that link for $40 of free credit!) or staying at Safe Haven Hostel. Safe Haven was opened recently and is small and basic, but the owner is super friendly and helpful, it’s centrally located, and it’s probably the cheapest you’ll find in Belize City. Belize City isn’t a massive tourist hotspot, but use this day to catch up on rest and wander around the city a bit. 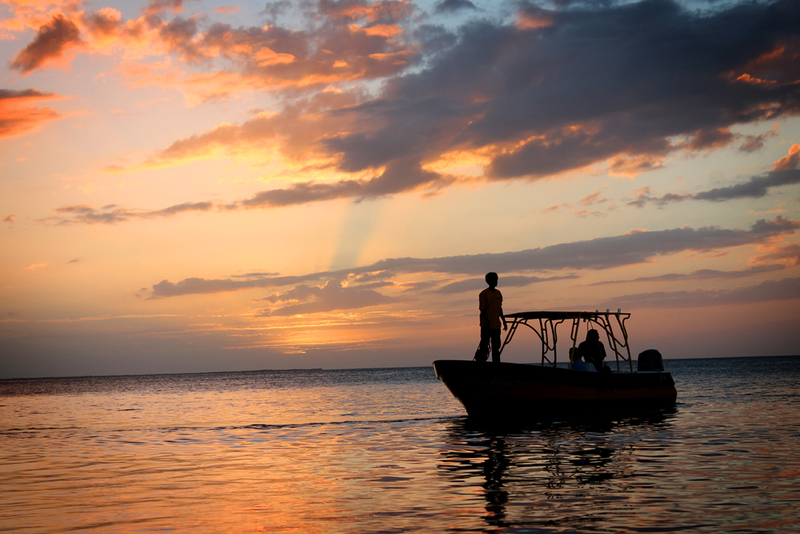 Pay a visit to the colorful Belize sign pictured above and watch the sun set over the ocean. 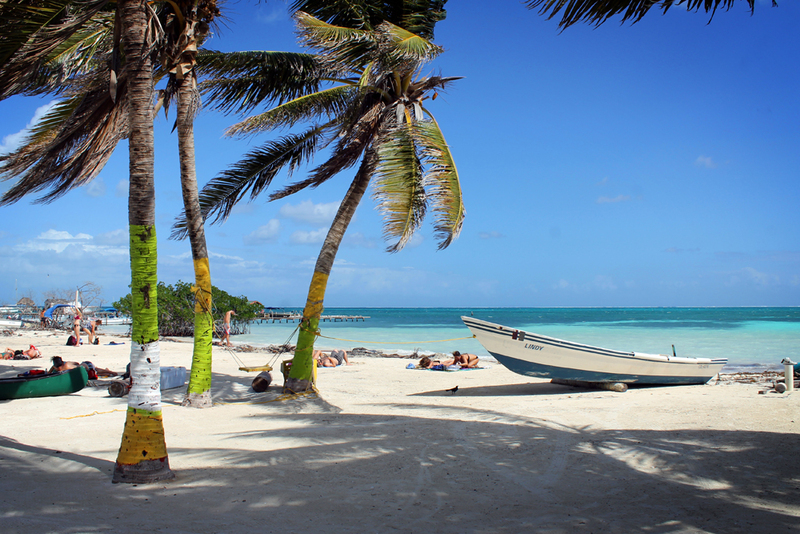 It’s time to head to paradise, the gorgeous Belizean island of Caye Caulker! Ocean Ferry Belize has water taxis leaving from their office near the Belize Swing Bridge. A round-trip ticket will set you back $14.50 U.S. Ferries leave at 8am, 10:30am, 1:30pm, 3pm, and 5:30pm and take about 45 minutes. Or if you want to guarantee a seat on the ferry by booking in advance (especially if you’re traveling during peak season! ), GuateGo offers ferries and buses with routes all over both Belize and Guatemala, including Belize City to Caye Caulker. Once you arrive at Caye Caulker’s port, everything on the island is fairly walkable. I recommend Bella’s Backpackers, which is centrally located, comfortable, and social without being too noisy. Caye Caulker is a small island that won’t take long to explore, but their motto is “Go slow,” so spend day three doing just that. Take in the views of crystal clear water (you’ll find the bluest water at The Split on the north side of the island), relax with a beer over the sea, feast on inexpensive lobster, and enjoy paradise. 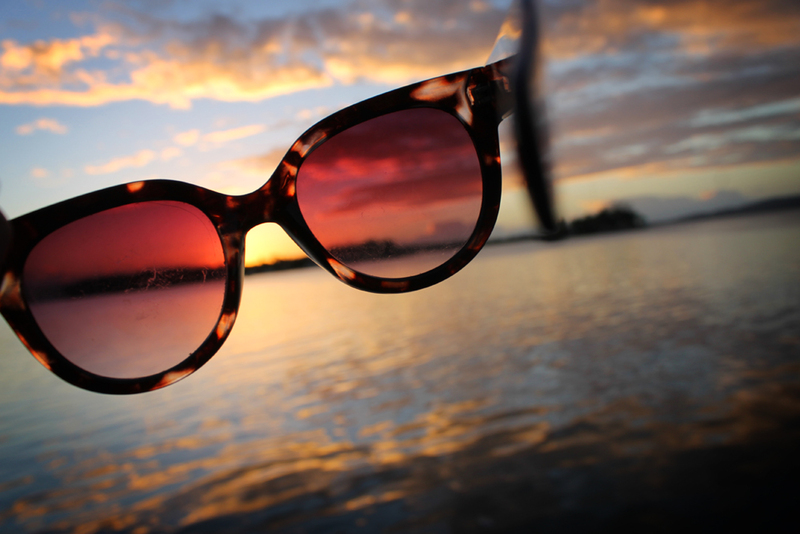 And don’t miss the sunsets! 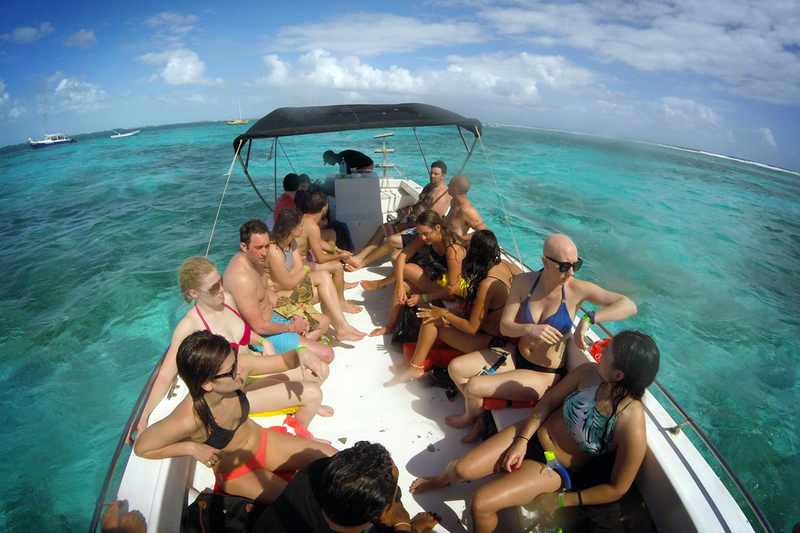 Caye Caulker is more about rest and relaxation than adventurous activities, but the one activity you can’t miss is a snorkeling trip. 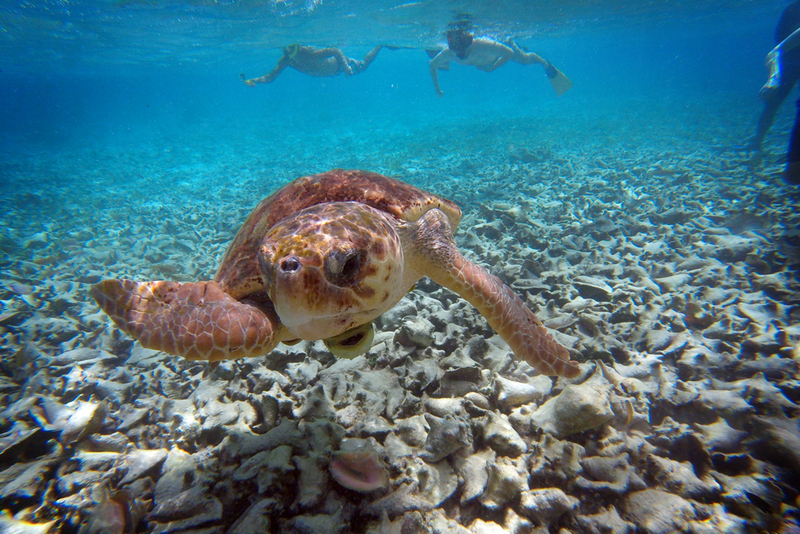 If you walk up and down the island’s main street, you’ll find tons of companies offering half-day and full-day snorkeling tours. Most offer similar trips and are right around the same price. I personally recommend Caveman Tours. Their full-day tour, at $65 U.S., is the cheapest I found on the island and includes gear, lunch, fruit and water. Their half-day tour (with gear, fruit, and water) is just $35. I opted for the full day and totally recommend it, as some of the best snorkeling destinations are only reached on the longer tour. The owner, who calls himself Caveman, is an absolute delight. I’ll admit I was hesitant to pay $65 for snorkeling when I had recently experienced shockingly inexpensive snorkeling trips in Indonesia’s Gili Islands and The Philippines’ Dumaguete, but within three minutes of jumping in the water, I knew I had made the right choice. If the stunning Caribbean Sea views weren’t enough, I had sea turtles swimming within arm’s reach and got up close and personal with sharks, stingrays, colorful fish, magnificent coral, and more. several people also recommended Ragamuffin Tours to me. Their full-day snorkeling tour is $70 U.S. but it includes unlimited rum punch on the ride home, so if you’re looking for more of a party atmosphere, they’re the way to go. Strap yourself in for a long travel day — but the destination will be well worth it! 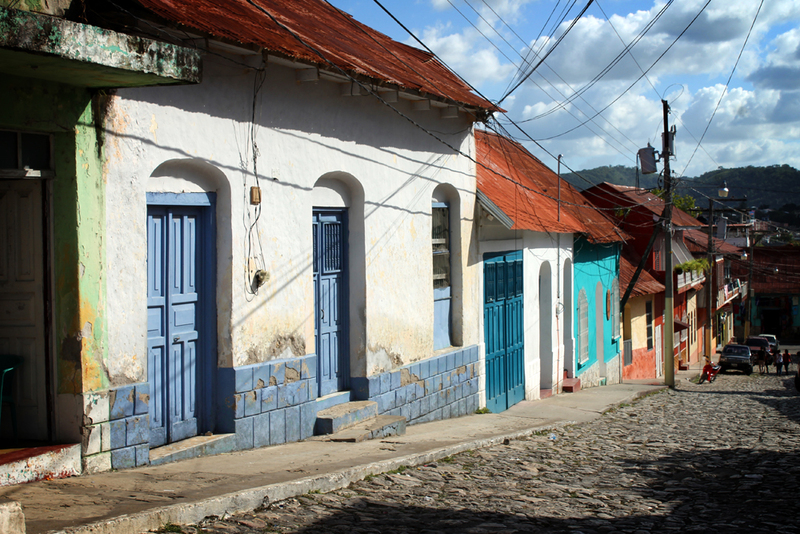 San Ignacio, Belize, sometimes referred to as Cayo, is a great spot from which to access fascinating ruins and a perfect stop on the way to Guatemala. To get from Caye Caulker to San Ignacio, you’ll first need to hop on a ferry back to Belize City. Ocean Ferry Belize leaves Caye Caulker at 6:30am, 8:30am, 10:30am, 1:30pm, and 4:30pm. From there, you have two options: private or public bus. Private buses will pick you up directly from the Ocean Ferry terminal and will cost about $25 or $30 U.S. I personally recommend taking a public “chicken” bus. Throughout Central America, chicken buses are converted U.S. school buses that tend to be the cheapest mode of transportation. They can be crowded and chaotic, but the bus from Belize City to San Ignacio was easy, I had plenty of space, it runs more frequently than the private bus, and it cost only $4.50 U.S. to cross the country. You’ll just need to make the 10-15 minute walk from the ferry terminal to Belize City’s bus terminal, and once there you can ask anyone for the next bus to San Ignacio (most will terminate in Benque, at the border with Guatemala). 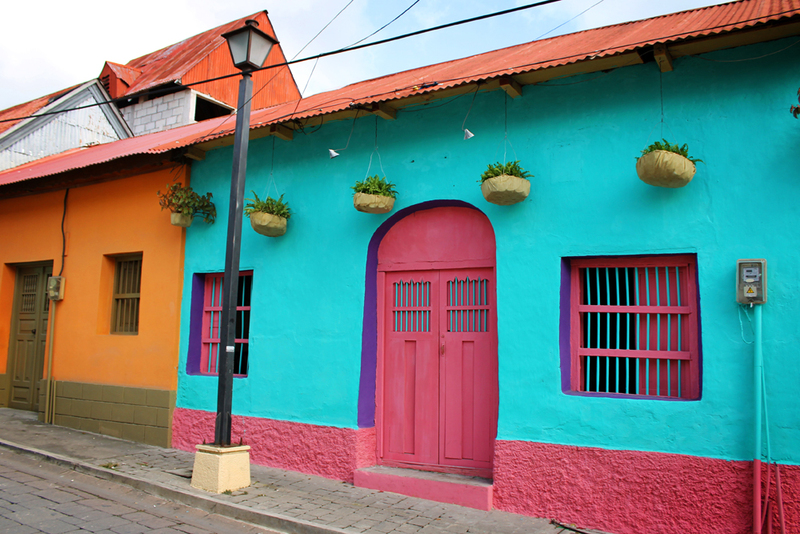 You’ll likely arrive in San Ignacio in the afternoon, so take it easy and explore the small town a bit. Bella’s Backpackers in Caye Caulker was a hit, and their San Ignacio hostel was even better — big, clean rooms and a great rooftop common area with hammocks. Belize’s most popular Maya ruins date back to the sixth century AD and are located just outside of San Ignacio. Though smaller than some of Central America’s other ruins, Xunantunich wound up being my favorite because you’re free to roam around on your own, and the lack of crowds can really brings the history of the place to life. The cheapest way to get to Xunantunich is to hop on a local bus going toward Benque, cross the river on a free hand-cranked ferry, and then hike about a mile to the ruins. 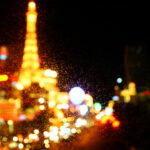 You can also negotiate with taxi drivers to get a fair rate directly to the site. No need to pay extra for a return trip, as you can hail a less expensive cab from the site or the main road (the walk back is mostly downhill) or catch the bus. Alternatively, Hanna Stables offers horseback riding tours to Xunantunich. 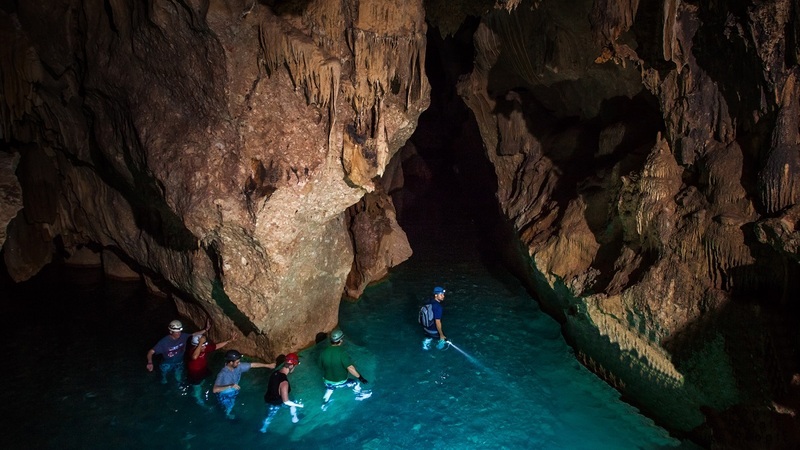 Many go to San Ignacio specifically to visit the ATM Cave, and it can’t be missed. Tours aren’t cheap (the best price I could find was $95 U.S.), and tourists can only visit with an official guide, but don’t let the price tag stop you. This was definitely one of the coolest things I experienced in Central America. Buried deep within the cave is an ancient Maya sacrificial burial site with loads of relics and remains that have been left where they were first found two decades ago. As interested as I was in seeing this bit of history, what I didn’t expect was the total adventure of getting to it. I took a tour with Carlos the Caveman Tours, who I would 100% recommend for the price, Carlos’ knowledge, and the overall quality. Exect a full write-up soon, but after traveling by van 45 minutes from San Ignacio, you’ll hike through mountainous forests, swim across rivers, and then arrive at the cave, where you’ll swim through dark crevices sometimes only inches wider than your body, scale waterfalls, and crawl around rock formations to reach the burial site. Pure adventure! Belize is not an easy country to say goodbye to, but Guatemala is calling, and there’s oh so much to do there! If you’re on a strict budget, to get to Flores, you can take the public bus to the border, cross the border by foot, pick up another bus to Santa Elena, and then take a tuktuk to Flores Island. Since border crossings can be complicated, I always suggest taking a shuttle that can guide you through the process. I used Mayan Heart World, which can get you from San Ignacio to Flores in a relatively comfortable shuttle for $25 U.S. (I was initially quoted $70, so be sure to insist on the $25 price.) Or to make booking even simpler and avoid bartering, I again recommend GuateGo for getting around Guatemala. Can I please live here? Most travelers use Flores simply as a base from which to visit the ruins of Tikal, but it’s an absolutely charming place on its own. It’s located on a tiny island within Lake Petén Itzá and its cobblestone streets lead you through colorful colonial houses and views of the surrounding lake. Exploring Flores won’t take long, but use your afternoon to wander around and book the following days’ activities (more on where to do that in a minute). I stayed at Hostel Yaxha, which was just fine and serves good food, although it’s not very social. If you’re looking for something more social, I’ve heard positive reviews of Los Amigos. Notice that tourism in this region is massively Maya-centric? 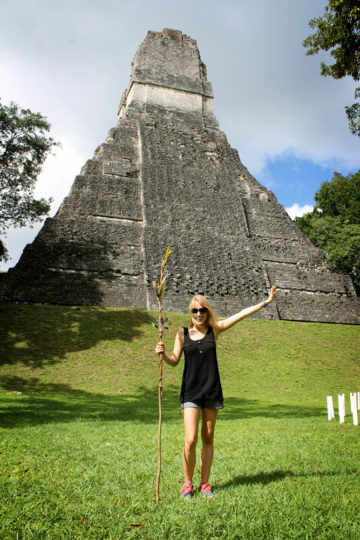 You can’t pass through northern Guatemala without visiting the archaeological site of Tikal. This UNESCO World Heritage Site was, as long ago as 400 BC, an ancient Maya city, and its sprawling grounds and massive, restored pyramids are well worth a visit. Though you can explore the ruins on your own, I’d recommend hiring a guide, as it’s easy to get a bit lost and understanding the history of the place really enhances the experience. Travel agencies around Flores will arrange transportation and guides for you. I recommend Tayasal. The owner, Luis, is extremely knowledgeable about the area, speaks perfect English and Spanish (he spent many years in the U.S.), and really cares about his clients. I booked several parts of my trip through him, and, each step along the way, he messaged me to make sure everything had worked out smoothly. The upside to Guatemala is it’s a diverse country with lots to experience. The downside is it can take quite a while to traverse and transportation isn’t the best, so be patient. Chicken buses are the cheapest way to get around the country, but often getting from one place to another involves a combination of various chicken buses and taxis. Shuttles (vans or minibuses), though often cramped and hot, can make your life a lot easier. Lanquín is a small town in the middle of Guatemala that doesn’t have a lot to offer on its own, but it’s the main town near the popular natural pools of Semuc Champey and a good stop between Flores and Antigua. Prepare yourself to an eight or so hour shuttle ride from Flores to Lanquín, but don’t worry — the fun will start tomorrow! The shuttle can be booked at travel agencies around Flores. I booked mine in advance through Luis at Tayasal. I stayed at El Muro Hostel for the price and proximity to the center of Lanquín, and it has a nice bar and restaurant area (social but not too loud) and beautiful views over the jungle valley. Zephyr Lodge is also popular among backpackers looking to party. 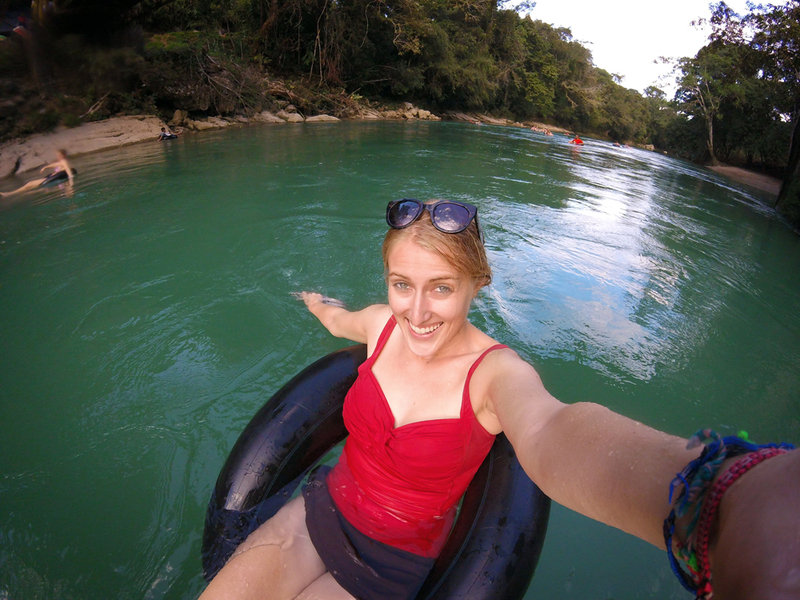 I almost skipped Semuc Champey during my Guatemala trip, figuring it was too far out of the way just to see some natural pools. But when I realized it broke up the trip from Flores to Antigua and that shuttles were fairly straightforward, I thought I’d give it a try. Adventurous Kate wrote that it was her favorite day in Central America, and my expectations weren’t nearly that high, but guess what! 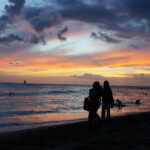 I think this was my favorite day in my two and a half months in Central America too. 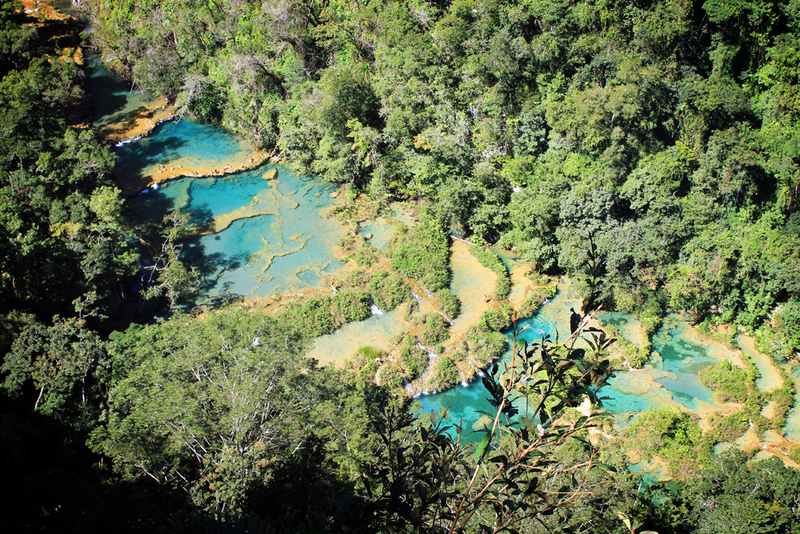 Semuc Champey can be visited on its own, but to make the most of your visit, I definitely suggest booking a full day tour through your hostel. It should cost around $25 U.S., and it’s a completely action packed day. After riding, standing up, in the back of a rickety pick-up truck, you start with a steep hike to a viewpoint overlooking the pools, then you climb back down to experience the pools first-hand, wading, swimming, sliding down waterfalls, and exploring mini caves. After lunch comes my favorite part of the day: armed with candlesticks to light the way, you head into a bigger cave, where you’ll be up to your waist in water crawling through the spooky crevices and climbing underground waterfalls. Then, to wrap it all up, you jump in innertubes and float down the river. Gotta love the crafty locals who approach you in their own tubes selling beer! The two weeks are flying by, and there’s just one destination to go: Antigua. Located half an hour from Guatemala City, this is a much better option for travelers than the capital, as it’s safer and much more charming. It may feel like a massive city after the rural spots you’ve come from, but it’s all completely walkable and has a ton of small-town charm. The easiest way to get from Lanquín to Antigua is by shuttle. 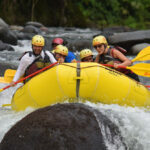 These are less frequent than the ones from Flores to Lanquín, so book yours in advance. I was able to book mine back in Flores, also through Luis at Tayasal. It’s another long ride, but the 6am shuttle will skip the traffic you may hit on the later one. Wander around Antigua this day. 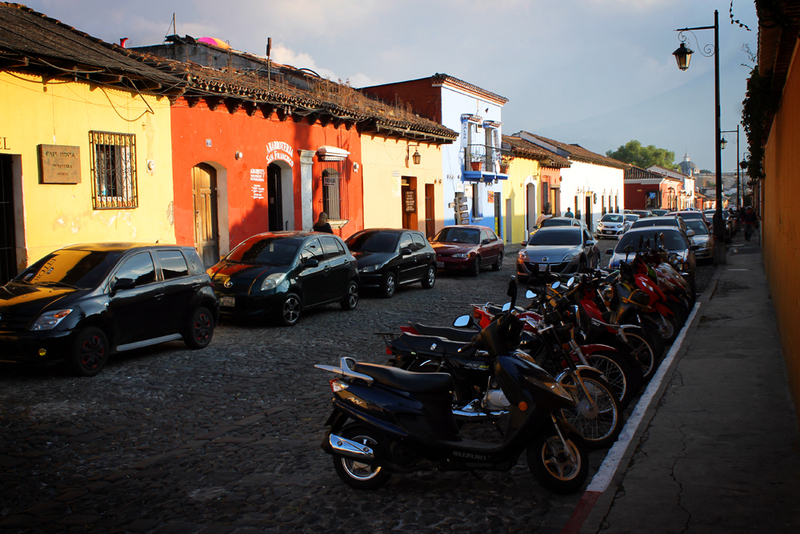 Visit its local market and souvenir shops, watch street performers, have a typical and inexpensive Guatemalan meal at Rincón Típico, and sample mezcal at the candlelit Café No Sé. Matiox Hostel is a bit farther from the center than some other hostels, but it’s also one of the nicest, cleanest, and most comfortable hostels I’ve ever stayed in. 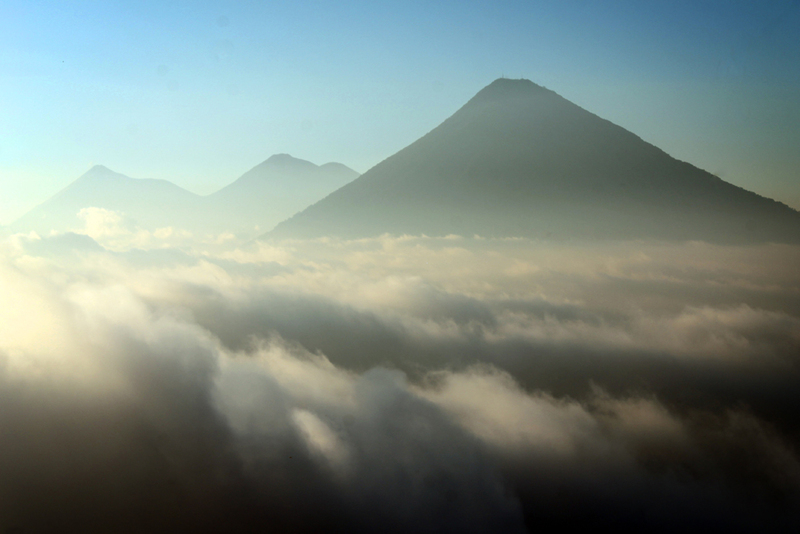 Spend your morning enjoying more of Antigua, and use the afternoon to visit Pacaya Volcano. Matiox (or most other hostels) can book this tour for you, which includes transportation and a guide. You’ll take a steep hike up an active volcano (tiring, but it will pay off! or you can pay extra to go on horseback), and at the top you can roast marshmallows right on the steaming lava rocks. When I went, the volcano was shrouded in dense fog, but just as we reached the top, the clouds cleared and we had spectacular views of the surrounding, still-erupting volcanoes and the valleys below. Day 14 – Adiós, Guatemala! All good things must come to an end. From Antigua, you can get a van transfer directly to the Guatemala City airport for about $10 U.S. Most hostels and travel agencies in Antigua should be able to book this. Just make sure to give yourself plenty of time before your flight, as traffic in the capital can be nasty. If you’re traveling during peak season (December-February is popular among backpackers), be sure to book accommodation and transportation in advance whenever possible. It fills up fast! See if you can check out an important celebration while you’re traveling through the region! This guide to Guatemala’s best festivals may help. Central America doesn’t have the best reputation in the world in terms of safety, but I felt very safe throughout both Belize and Guatemala. Nonetheless, use common sense. Don’t wander alone late at night, and keep your valuables close or leave them locked up at your hostel. English is the official language of Belize, although you’ll also hear Creole and Spanish. 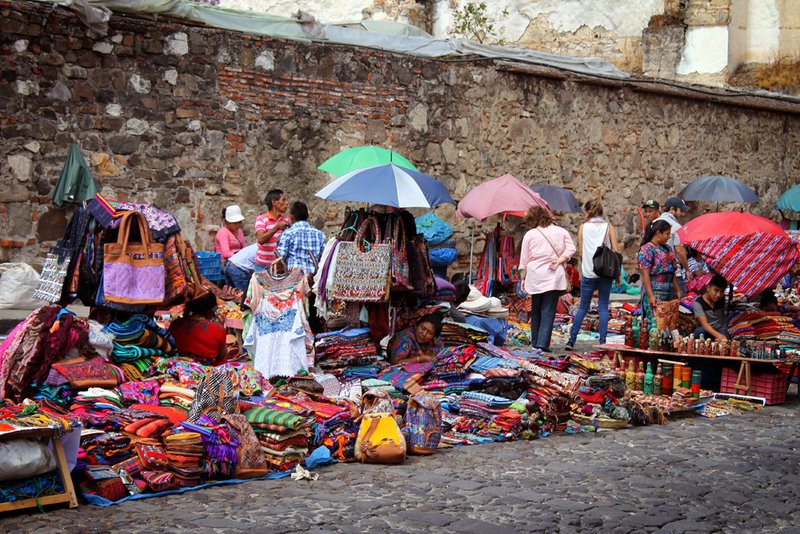 Many Guatemalans in the tourism industry speak English, but picking up some key phrases in Spanish can go a long way. Keep an eye out for wildlife, especially when exploring Xunantunich and Tikal! You’re likely to spot monkeys and exotic birds, and my guide at Tikal says he’s even seen a jaguar there. It’s tough to see all of both countries in just two weeks, but if you have extra time, I’ve heard excellent things about Lake Atitlán in Guatemala. Both countries are generally very hot and humid, but it can get chilly in places, especially around Antigua, so pack a jacket and a pair of jeans. Oh “Guat” (stop cringing!) wonderful countries Belize and Guatemala are. Enjoy your travels, and be sure to share any and all suggestions you have in the comments below! Disclaimer: This post contains affiliate links, and I was partially hosted by Carlos the Caveman Tours, but all opinions are entirely my own, as always! 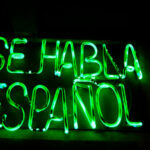 So You Want to be Fluent in Spanish? Don’t be afraid! I definitely encourage you to go! This is the post I was looking for 🙂 Thanks for all your great suggestions! Were the buses brutal, or were they decent? I’m trying to decide if a plane ride would be worth it (Belize to Guatemala), but then it sounds like I’d miss out on your favorite day trip in Guatemala! That’s great to hear! 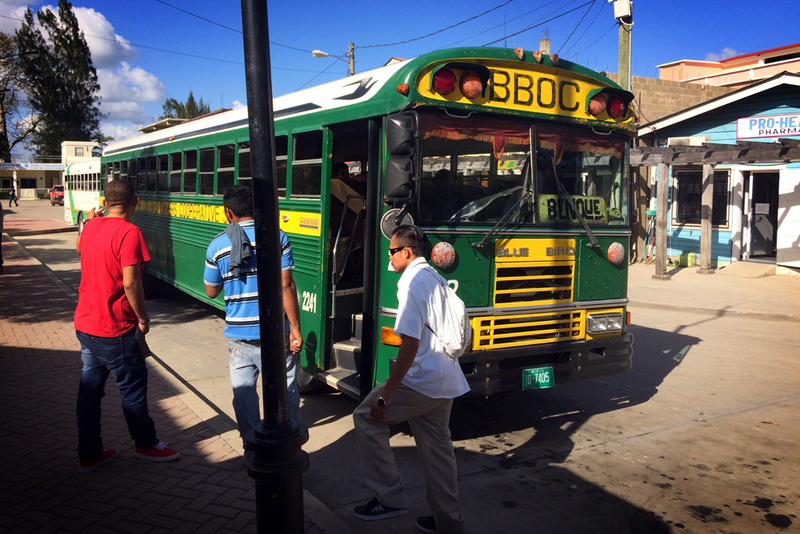 The chicken bus I took from Belize City to San Ignacio was pretty basic (just a converted school bus, no air conditioning), but it was a short ride, so I didn’t mind. There are also options for air-conditioned coaches for a little more money. Within Guatemala, the vans were pretty crowded (they’ll fill every space, including the jumpseats), which made them less comfortable. Air conditioning is rare, although open windows keep it pretty cool. Some agencies will offer “luxury” vans, but, unless you’re splurging on a private transfer, these don’t seem to be much of a step up. The vans are definitely not as nice as coaches, since you don’t get as much space and the seatbacks are usually too low to lean back, but they aren’t dreadful or anything. The biggest thing issue is the length of the bus/van rides. If I recall correctly, Flores to Lanquín and Lanquín to Antigua were both about eight-hour trips, and there aren’t a whole lot of destinations between those to break up your travel time. So I think it really comes down to how much time you have to spend in Guatemala and how much patience you have for transportation! 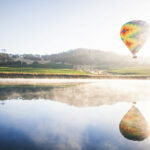 I personally enjoy the long rides, because, when I’ve been traveling at a hectic pace for a while, they give me a day to relax, catch up on reading, watch a few TV shows, etc., but these rides can be draining for others. I also enjoy observing the countryside and small towns. Hope that helps a bit! Think about how much time you have, which destinations you want to prioritize, and how much tolerance you have for less-than-comfortable transportation, and that should help you decide. Let me know if I can answer any other questions, though! So lovely post. I like it. Thanks so much for the good post. Inspiring and very informative description of your trip, It was what I was looking for. I’m planning a 3 -4 weeks in Guatemala and the region around (still pondering whether doing Belize or part of Mexico that I haven’t been yet), but I guess that making the same route as you did at a slower pace, and maybe add some attractions would fill my plan. Glad you found it helpful, Amit! That sounds like an amazing trip. I would have loved to have a few extra weeks to explore. You’ll have a fantastic time! I was wondering how much it cost for your trip (without the plane)?? Unfortunately I don’t have any notes about my budget during that time. I was definitely able to see both countries on a backpacker budget, though! 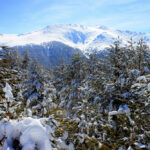 You can find good deals for lodging and food especially.